While Jay Culter was quiet in his debut and Senorise Perry put the Miami Dolphins up early, the rest of the game belonged to the Baltimore Ravens. With Joe Flacco out, Ryan Mallett threw a touchdown to Larry Donnell, and despite other players like Danny Woodhead and Terrance West staying quiet, QB Josh Woodrum ran in two scores to help lead the Ravens to a 31-7 victory. Williams has yet to live up to his second round draft status, but fully healthy he looked the part against the Dolphins. He had the play of the day on a 40-yard reception breaking multiple tackles late in the third quarter. He also handled himself well as a run blocker. 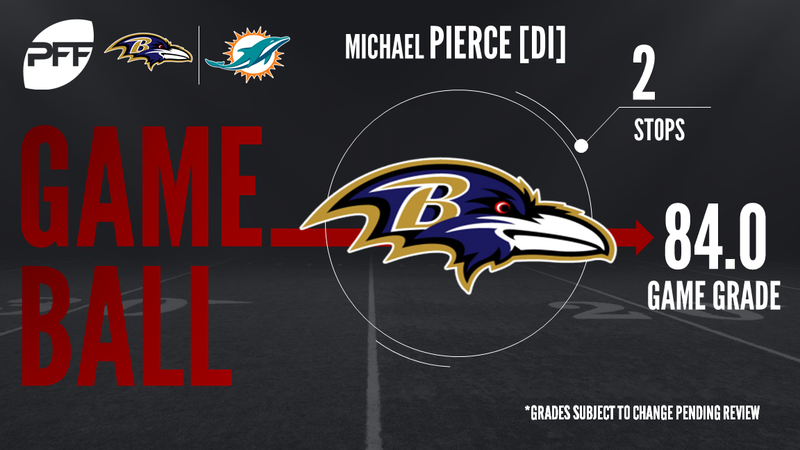 Pierce was a breakout player for the Ravens last year, and flashed his all-around ability tonight against Miami. He notched two QB hurries and seven total tackles, three of them going for run stops. Before leaving due to injury in the third quarter, Davis was having an excellent evening on the pass rush. He racked up a hit and three QB hurries on just 19 rush snaps, and also pitched in with two assists on run defense. With little to be excited about on offense, the biggest struggles are naturally going to be highlighted. Backup guard Jesse Davis may have had the roughest night on the Dolphins’ roster, as he gave up a sack, a hit and two QB hurries, and also struggled to sustain blocks in the run game as well. While the Dolphins were unable to sustain drives early in the game with Jay Cutler under center, his statline should have been better. Two of his three incompletions (on six official attempts) were a throw-away and a drop, and a 31-yard gain on a sideline comeback route was nullified due to a penalty. Expect to see a significant uptick in reps for him next week. The rookie from Clemson was all over underneath stuff Thursday night. He picked off one of his three targets and dropped another. Seeing Jordan Phillips among the highest graded players is very encouraging after seeing him struggle through the first two seasons of his career. He had two pressures, a batted pass and a stop on the day.